King’s Lynn butchers celebrate the arrival of Princess Charlotte with a bang-er! Princess Charlotte will have many honours in her lifetime but nothing will sizzle quite as much as a new sausage to mark her birth. 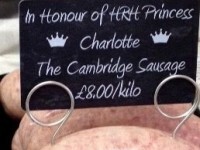 Gaywood’s Bowers Butchers is now selling a Cambridge Sausage to celebrate the birth of the Princess, who has arrived in West Norfolk with her parents and big brother. The Duke and Duchess of Cambridge have left Kensington Palace for the quiet of their country retreat, Anmer Hall, to spend important family time with Prince George and Princess Charlotte, who was born on Saturday. Butcher Richard Bowers and his team have taken the traditional Cambridge sausage recipe and given it a modern twist. Mr Bowers said: “We wanted to celebrate the birth of the Princess. “I know about different varieties of sausage and there is a Royal Cambridge recipe. In fact 2,500lbs of Royal Cambridge sausages went down with the Titantic. Mr Bowers says this sausage is gluten free and contains spices which would not normally be used.